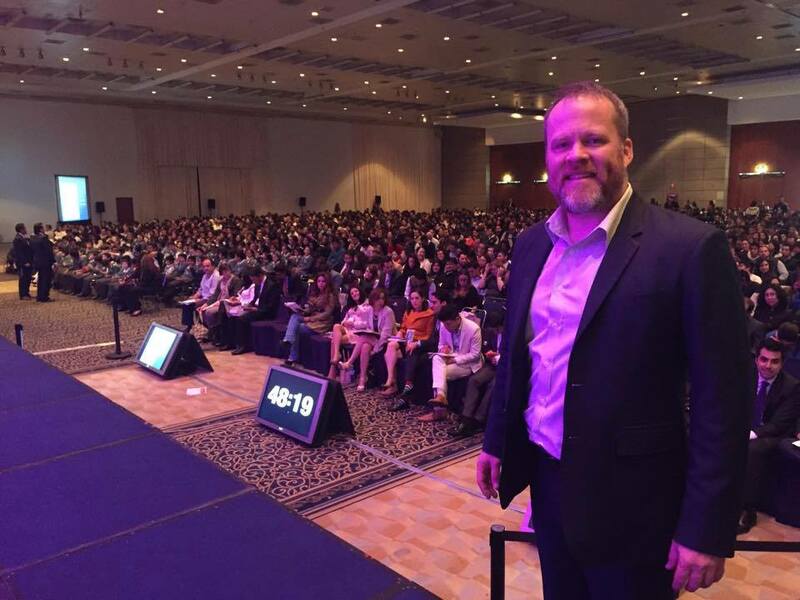 Ron at a speaking engagement in Mexico. How did you first get started with memory sports? My first exposure to the memory world was in the late 80s. There was a very successful infomercial then by Kevin Trudeau for Mega Memory. My friend and I were high school students and decided to put our money together to purchase the product. We never did but it made an impression on me. Then 3 week after graduating high school I took a job as a telemarketer. Three days into that job I cold called a guy who offered me a job as a telemarketer selling memory training. He was a manager for the company that Kevin Trudeau had started (although Kevin was now in prison for credit card fraud). I began selling memory training courses to businesses to improve business (remember names, give speeches without notes, etc.) in 1991 just three weeks out of high school. Ten years later I picked up the Guinness World Records book and read that Gert Metring had memorized a 27 digit number while the digits were flashed on the screen for 3 seconds. I interpreted this to mean each digit was flashed on the screen for 3 seconds or 81 seconds total. It never entered my mind that a person could memorize an entire 27 digit sequence in 3 seconds total. So I went on the Fox Good Day Dallas show to ‘break’ this record. I did. Kind of. I broke what I thought was to be the record and did 28 digits in 75 seconds. For a few years it was a big marketing strategy to plug myself as the guy who broke a Guinness World Record but 2-3 years later when I got around to filing it with Guinness I was told I misunderstood and I was horrified. I felt like a fraud. I planned to compete in 2007 but was sent to Afghanistan. I competed in 2008 and came in 4th. I hadn’t trained for the tournament but came in 4th. This is when I knew I could win. I hired a US Navy SEAL to make sure I was disciplined and we began an incredible time in my life. I didn’t just win in 2009, I dominated. When I walked in the room that day I remember looking at the trophy and saying to it, “You are coming home with me,” before anything had started. I felt I “avenged” my Guinness Record error in 2009 but I was hooked. I went on to compete in 2010 (and win again) and then 2011/2012 coming in second to Nelson. My last year to compete was 2013. Looking back I have a few regrets. I regret in 2009 when I went to the World Memory Championship I hadn’t flown in the night before. I had zero sleep and it really impacted me. I also didn’t know all the rules and for 60 minute cards was thrown for a loop when I had to write out my answers (instead of assemble a deck of cards). Nelson made losing easy. What I mean by that is he didn’t just beat me in 2011/2012. He destroyed me. There was no thought in my mind like, “Oh I could have done this different and won.” He made it clear he was the champion and that made losing a little easier. What’s been your biggest takeaway from your experiences with memory sports? Don’t doubt yourself. Compete even if you think you don’t have a chance. By pushing myself I surprised myself with how much I could memorize in a short amount of time. I won the USA Memory Championship the first time at age 36. Today at 42 I feel like I am just as good or better than I was at 36. Also, for me. Winning the tournaments was an incredible high in my life but the person I had to become in order to compete (disciplined, organized, determined) was an equally powerful reward. So whatever it is you want to do kick the doubt out of your brain. You are probably a lot more capable than you are giving yourself credit for. This one's along the same lines, but is there any other key advice you'd give to someone wanting to start competing in memory? What about to someone just wanting to use memory techniques in their daily lives? My advice to someone wanting to compete is to ask around for advice from those who have been there. In 2008 David Thomas (the 2007 USA Memory Champ) was attending just to observe. He told everyone he would gladly coach for free anyone who wanted to train and win in 2009. Amazingly I was the only one who accepted this offer and I won. I think too many think, “I am going to do this my own way.” You should do it your own way but only after you have listened to those who have done what you want to do and then tweak it to fit your style. For those in daily life do this: every time you meet someone for the next month turn their name into a picture. For example, Steve = stove, Lisa = Mona Lisa, Brian = brain. If a person will do this at the end of the month they will have turned at least 100-200 names into pictures and then once you decide Steve = stove (or whatever) then use that for every Steve. If a person does this simple drill they will get much better at remembering names by visualizing these pictures when meeting someone. The next thing I would advise for the every day person is to learn the Mind Palace method. I may be biased but I think this is a great video explaining the Mind Palace. You've done a bunch of interesting things, like TV appearances, memory challenges, etc. What are some of your favorite experiences? My favorite TV appearance without question was Stan Lee's Superhumans. Partly because it was the History Channel and I love that channel and partly because it was Stan Lee (Spiderman and Incredible Hulk creator). It was also a fun show going to a Home Depot and I memorized product prices off the shelf. I will be on a new TV show on Fox called Superhuman airing in January. The memory challenge I did for this was the toughest memory challenge I ever performed on a stage in front of an audience and I am proud of how I did. Whether I win or not (to be seen January 4th) is not the important thing for me. The important thing is I had the toughest memory challenge on that show and I nailed it. What are some of your future plans, both within the memory world and outside it? Anything in particular you're looking forward to? In the last 24 years I have taught my memory seminar in about 40 states. I mean I went to 40 states and was paid to teach the seminar. I've done the same in about 35 countries (not traveled to but actually was paid to speak in 35 countries). It has been a whirlwind 24 years but my primary goal is to travel less and sell more of my online product. I love travel but on my terms. Flying to Australia, landing on Friday night, speaking on Saturday and flying home on Sunday, which I've done, is for the birds. I hope also to be able to teach memory to students and get some student memory tournaments set up. Outside of the memory world, I just earned my blue belt in Jiu Jitsu and I would like to get very good at Jiu Jitsu. I'm not as concerned about the belt as I am staying in shape and developing my skills. I also hope to buy some land and build a log cabin home shooting tins cans while sitting on my porch listening to baseball on the TV. That's my biggest goal right now and I'm not joking. Thanks for your time, Ron.